Brian Solis is a Principal Analyst at Altimeter Group, a research-based advisory firm that helps companies thrive with disruptive technologies. Digital transformation is the latest trend in business where companies invest in new technologies to align with the evolution of customer expectations and behavior. Even though digital transformation implies a technology first approach, it is in fact a much more human process. Everything begins with understanding where and how traditional strategies and models stray from the activities and expectations of digital customers. Change then becomes informed by gaps and opportunities that emerge as a result. It’s all a bit counter-intuitive though, especially to anyone who lives and breathes technology like I do. To help understand what digital transformation is as well as its promise, I spent the last year along with my colleagues at Altimeter Group interviewing those who are leading change at some of the biggest companies in the world. Most recently, we also fielded a survey to capture the true state of digital transformation to help change agents plan their next steps as well as providing a benchmark for later comparison. You can download the new report here. Whether we like it or not, everyone around us, most likely ourselves included, is living an ultra-connected digital lifestyle. As much as we point fingers or talk about digital detox, our connectedness is only getting more connected with every new device, app, and network. Go to any restaurant and glance around the room and marvel at the number of people taking pictures of food or themselves or glaring at their phones instead of having conversations with those at their table. 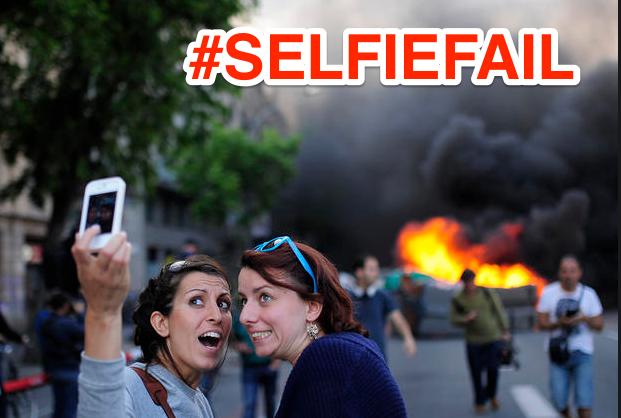 It’s as if the conversations nowadays are dictated by what happens on screen rather than real life (IRL) moments. Looking just over the horizon, we’re just around the corner from a new wave of devices and networks that will plug our bodies into the Internet of Things. We’ll become part of an interconnected network just like Google’s Nest thermostats. While it might all sound a bit ridiculous on the surface, ranting about the days of yore or sharing experiences about what life was like “in your day…” don’t really help us figure out what’s next and what to do about it. On the other hand, the most progressive businesses I’ve studied in my research are learning how digital customers behave differently than before and what it is they value, expect and also how they make decisions. Indeed, customer use of technology is changing and so is that of employees and prospects. Over the last year, I interviewed over 20 executives at some of the world’s most renown brands including Starbucks, Lego, Sephora, GM, Westfield, Univision, Fidelity, among others. This initial research was released and is available here. Following these interviews, I set out to capture a snapshot of the state of digital transformation. This new report was aimed at executives and digital strategists to help them (you) plan next steps and investments. Our goals were twofold: 1) to unearth where companies and supporting teams are in their metamorphic digital transformation efforts; and 2) also to capture a current snapshot for future comparison. In both research endeavors, we found that understanding the digital customer experience is one of the primary catalysts for businesses placing substantial investment in digital transformation. Thus, progressive companies are refocusing and reorganizing teams to modernize, optimize and integrate digital touchpoints. Once they do, they can’t help but see this connected customer in a different light. Instead, digital transformation is a leadership initiative that unites individual technology efforts around a common vision supported by an updated, integrated infrastructure to effectively compete as a unified business in connected markets. There’s a difference. 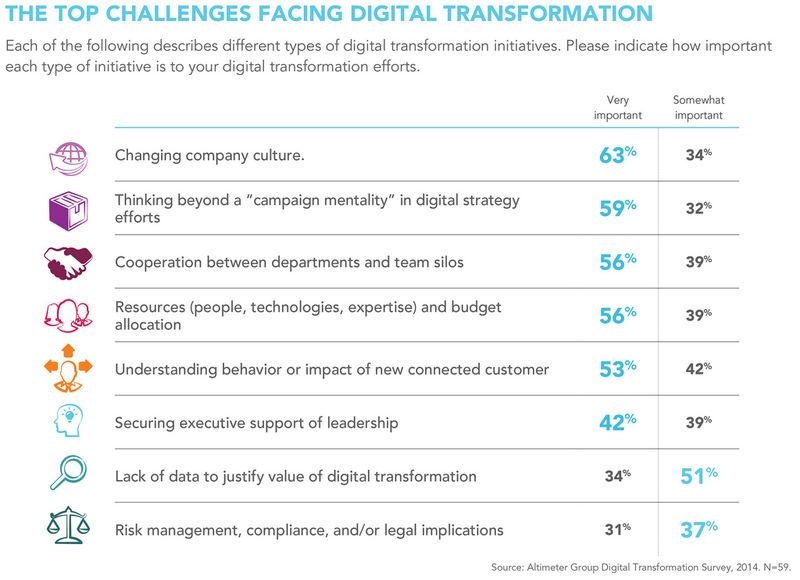 Interestingly, 88 percent of executives and digital strategists we surveyed stated that their company is undergoing a formal digital transformation effort in 2014. That’s huge right!? It’s also something that we theorize is a misnomer. In the same vein, we found that only 25 percent of businesses had actually mapped out the digital customer journey. And, just 17 percent of digital leaders were beginning the process of studying the digital customer journey. Without studying the differences between traditional and digital customers, making new technology investments will most likely miss the human mark. So what’s holding businesses back from embracing the need or effort to lead digital transformation? It may or may not surprise you. The number one answer at 63 percent was company culture. In the end, this really is about change management and getting stakeholders to thrive in a culture of innovation requires vision, business cases, and a whole lot of convincing. We need to broaden our horizons of course. At the same time, we cannot use technology as a crutch to placate deeper problems or obstacles within the organization. Customers don’t see departments; they see one brand. Digital transformation efforts are or should be aimed at optimizing the entire customer journey, uniting disparate work groups and departments, and aid in delivering real results against over-arching business goals. That’s the essence of meaningful change. The rest is simply trying to use technology to scale reach but not improve how companies use technology to foster customer engagement. 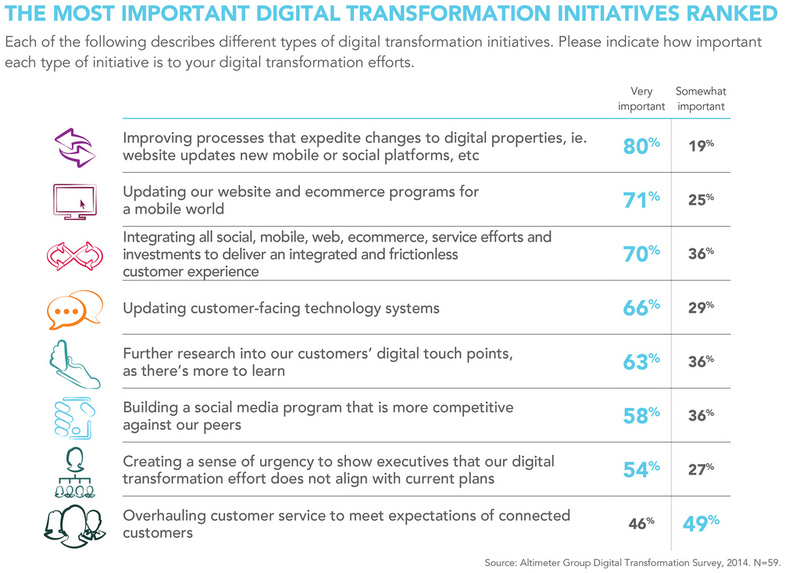 We asked participants what digital transformation initiatives were the most important to them. At the top of the list was improving processes that expedite changes to digital properties, i.e. website updates, new mobile or social platforms, etc. (80 percent). That doesn’t scream integration to me but decision-making does help. Ranked third though is integrating social, mobile, Web, e-commerce, service efforts and investments to deliver an integrated and frictionless customer experience (70 percent). And in fifth place was to further research into customer digital touch points (63 percent). Surprisingly, at the bottom of the list was a desire to overhaul customer service to meet the expectations of digital customers (46 percent). Unfortunately, many executives still see technology as a way of increasing operational efficiencies, margins, and scale. This is the time however to invest in new technology to enhance customer relationships and experiences. That doesn’t mean using tech to further distance them from us. While it’s rapidly gaining momentum, digital transformation as a formal process is still in its infancy. In its own way though, understanding technology’s relationship with customer behavior represents an opportunity to make businesses more human.